You can use the Unity development tools to create apps and games for Amazon Fire TV devices as you would any Android device. Although we do not provide a Unity plugin for Fire TV development, there are packages in the Unity Asset Store to enable game controller support. In particular, InControl by Gallant Games is one with which our developers have had great success. InControl is a cross-platform input manager for Unity3D that standardizes control mappings for a variety of common controllers. You can also use the Unity input manager to configure controller input for your game. Use the tables below to map the buttons on the Amazon Fire TV remotes and game controllers with the Unity input manager buttons and axes. Note: The input references in this document apply to Unity 4.3.x and higher, but are subject to change with future Unity releases. 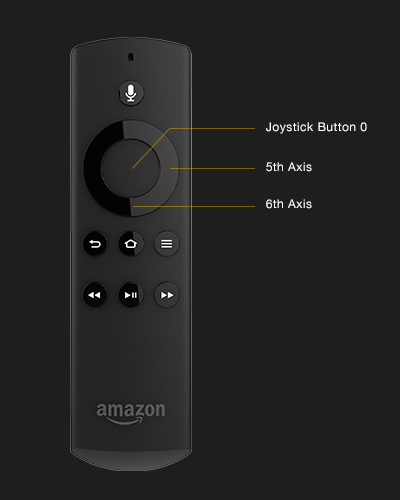 Use these values in Unity to map the buttons on both the Amazon Fire TV Remote and Voice Remote. See KeyCode for more details about Unity KeyCode values. 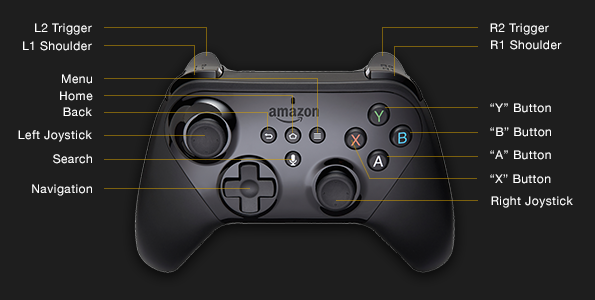 Use these values in Unity to map the buttons on the Amazon Fire Game Controller. See KeyCode for more details about Unity KeyCode values. Remote: "Amazon Fire TV Remote"
Voice Remote: "Amazon Fire TV Remote"
Game controller: "Amazon Fire Game Controller"